AAP won it in Delhi. Or, is it BJP that lost the election badly? Questions are many and so are the surprises. A score line that reads 67-3 is more like a Cricket score board than the seat tally of a state election. No doubt on the convincing nature of the margin and with due respect to the voters of Delhi, they didn’t even want an opposition in the assembly. Before we move ahead, I must request AAP to not allow BJP to even have the position of LoP because they simply don’t deserve it. Like what BJP did at the center, I expect AAP to snub away any claim of BJP for the leader of opposition in the assembly because that is the rule. And, as it is, a mere 3 number of constituents don’t count as opposition in any way. How this happened? Someone who is/was and most probably will always remain an escapist in his life got back to where he promptly ditched a year back. In true sense, people of Delhi appear to be real “Dillwallas” to forgive such untrustworthy act in a years’ time. For debate we can dissect everything that we have, depending on which side of the political fence we are sitting, but the fact remains that, people of Delhi not only forgive Arvind Kejriwal but also believed that the man is genuinely repenting on his earlier mistakes. Perhaps and I hope, people of Delhi are much smarter than many of us and know what exactly they are doing or have done. Only wish – people of Delhi won’t turn around later and cry for their mistake. “You Deserve It” would be the only consolation that would be dished out in return, if that happens. You repeat it twice in a row and it no more remains a mistake. Since the Delhi polls are done and dusted, BJP must sit down and do something called introspection. For an average layman like me, it is more like BJP losing the election than AAP winning it. If vote percentage is taken into account, BJP still have the same vote share that they had last time. But the number of seats has taken a beating. This suggests a gross failure in strategy than voter’s wrath. We will get to that analysis part a little later. But before that we must stump on the fact that, a small state (even I hate to call it a state) like Delhi has its election held at par with the general elections or may be even more. Far bigger states like Rajasthan, Maharashtra and Haryana never got the same amount of cacophony as Delhi did. A close look at Delhi elections and you get that feel of hype immediately. Why Delhi of all the states got the maximum attention of our media? They may make you believe that Delhi being the power center of the nation calls for bigger attention but that is far from being the truth. And the truth is; the hype around Delhi elections is because of the desperate attempt of our media and the secularists to downplay Narendra Modi by any means. An election which can’t be described anything beyond a municipality election in national terms is touted as a watershed event in our democracy because the media syndicate for the first time sniffed a chance to decadent Modi. They felt the euphoria within with the prospect of lambasting Modi and his ineffectiveness after failing to do so in last 12 years. Starting with the 2014 general election and the state elections that followed, our secularists were desperately waiting for that one moment to declare Modi a loser but that moment never arrived. In event of such desperation, Delhi election was that trace of light at the end of the tunnel for these secularists. So Delhi election being blown out of proportion is nothing but on the expected lines. That is perhaps why, many of our secular newspapers published special afternoon editions today to celebrate their much needed small victory in demining Narendra Modi finally. Have you seen them coming out with any such edition on May 16th last year? Well, why should they? After all, how come the secularists celebrate the victory of a fascist BJP? But all said and done, BJP did lose it. In fact they lost it badly. And blame need to be shared in proportion. The biggest chunk of blame must go to Narendra Modi and Amit Shah. For reasons best known to the strategist in Amit Shah, Delhi elections were held way too late. In fact late by at least six months. I am sure, had these elections were held in September, AAP would have been wiped out from Indian political scene. Don’t know why but BJP kept on dragging its feet over Delhi poll dates. I blame Narendra Modi because I found him wasting his time in election campaigns than running the nation. Over the last 8 months Modi was seen campaigning for every state that went to polls. The deliveries that were promised before the national elections never took the attention of the PM. Nobody was expecting results in 8 months but at least there could have been some visible attempt at fulfilling the promises. But strangely, Modi continued with his campaign mode than running the government. And, I being a citizen of this country object to such mishandling of a PM’s role. Beyond a point BJP has to find ways to win elections without Modi and they should learn it quickly. There are way too many in BJP who are non-deserving to say the least but occupying the positions purely on Modi’s fame. It is about time such incompetent people are shown the reality and I am glad the voters of Delhi showed them the truth finally. Second blame must go to the infighting in state BJP. Amit Shah’s idea to remote control everything backfired finally. To win elections, trust on your local leadership must be bestowed. The biggest mistake was the option of the CM candidate. If Manohar Parikar could be pulled from the state and put in center then why Dr. Harshvardan can’t be pulled from the center and put back in Delhi? Choice of Kiran Bedi, which appeared as a mistake initially in fact turned out to be a blunder. This is perhaps what happens when you trust too much on someone like Arun Jaitley who himself never won an election but decides the roadmap for the state election. At no point Ms. Kiran Bedi looked like a CM candidate. More than strategy, selection of Ms. Bedi appeared like the anxiety of BJP. All local tall leaders were ignored for Ms. Bedi and I don’t know why it should have been that way. This is where the strategy seems to have gone haywire. BJP which thought Delhi to be in their kitty concentrated on other state elections before coming here but ended up being too clever by half. The over confidence with the think tank in what they can achieve went beyond a point that made them find Delhi elections a cake walk. But reality has some very bad ways to make it remain relevant. And certainly there can’t be anything worse than a score line of 67-3 for BJP. Third reason is the arrogance of the BJP spokespersons appearing on TV. Unfortunately they are repeating what Congress spokespersons were doing during their heydays. Absolute disregard to the intellect of the voters is just one of them. Someone like Sambit Patra must learn to conjure up his thoughts with little humility. You can’t simply accuse AAP of anarchism when you yourself appear to be one. Mr. Patra seems to have done as much damage to BJP’s fortune in Delhi as Sanjay Jha did to Congress’s fortunes in 2014 general elections. I am sure BJP would give that much needed break to, not just Mr. Patra but many of its overworking spokespersons. But I don’t blame Mr. Patra alone. This is again what happens when you strategize around one man. Cult worshiping never lets you go too far. Be it Congress with their Gandhis or the state satraps that are more like family run enterprises; it always fails after a certain point. If Rahul Gandhi failing pathetically can’t juggle up as a good example for BJP to stop running around one man then I am sure 2019 elections would throw more such painful realities. People in BJP must let Modi do what he is been elected for than gathering votes for the party in every election. That not only is a bad strategy but also is a grave injustice to all the voters who made Modi what he is now. And it is not a secret that voters of today ate too impatient to take your party’s inner benefits in exchange of their votes for too long. I am sure there are people in BJP who know how to pull up their shocks and work professionally. No, I am not all considering Arun Jaitley as one of them. And, someone please stop this Ravishankar Prasad appear on TV altogether. To end the post, I hope Delhi sees a good time in future unlike the Anarchist 1.0 of last time. I know, the evangelist in AK would be itching to do an Anarchist 2.0 ASAP but for the people of Delhi, I pray, he stays away from any such adventure. And for the media, the secularists and the “Idea Of India” frauds who finally got a shot in the arm after prolonged wilderness – Victories in Lok Sabha, Haryana, Maharashtra, Jharkhand and J&K are nothing compared to the largest state of India called New Delhi. And by the way, I admit, I read the Delhi election completely wrong. As far as I remember, in one of your previous posts you justified Ms Bedi as the CM candidate and compared her strengths with AK. And in the present post you list her nomination as one of the reasons for the dismal performance of BJP. Could you explain this in some detail? I justified Ms. Bedi as a better candidate purely on basis of one-on-one achievement comparison, if you remember. AK for me, still is an escapist lout with no interest of taking to conclusion. Only time and his governance can change that opinion. 1. AK ranaway becoz he had no majority in the house and also becoz of lokpal issue, in todays politics show me a person who resigns on moral ground, until and unless he is forced to resign. 2. when anna hazare movement was going on against UPA 2 who helped in the movement, BJP, RSS, VHP, etc., and not to forget Ramdev, these organisations taught that the people to whom they are supporting and projecting in the front row will never backlash, but it has. at least harshvardhan would have been the CM candidate it would have bagged at least 7 to 8 seats. bringing kiran bedi was a biggest mistake. 3. let me remind you about the loksabha elections, if all regional and national parties would have been one than the central government would have been of 67%. and surely bjp would have not won the election. 4. let not the MP's of bjp open they filthy mouth and say vote for RAMZADAY AND HARAMZADAY. where are those slogans hum do hamare paanch or chaar. its enough stop polarizing. india is a great country, it does not have religion of its own but celebrates all religions. i am proud to be an indian. Let's first see what Nautankiwal delivers. Modi too has won hands down and despite opposition from one and all. And India is a Hindu country and will and should remain so, we have seen what's happening in Muslim majority countries, So you better stop lecturing. Most of your points make sense. But, Modi has to campaign in those states as BJP doesn't really had any credible face in those states, so no option for Rajya Sabha majority. The reason they lost in Delhi is a combined effect of Centre and local leadership (or lack of it). There was no strong BJP face in Delhi for counter narrative and to be honest most of Delhi MPs are proving to be quite useless and people are restless. Non-performance of MPs is punished heavily. Modi may be working day and night but his troops aren't and that's why they have to pay the price. In a way it's a good wake up call. IMHO Delhi can neither be compared to other smaller states nor its signicance can be under-estimated. Delhi is cosmopolitan city in the country (next only to Bombay). It reflects the mood of the nation simply because it has voter representation from most parts of the country. So instead of turning ostrich, BJP should seriously introspect. Electronic media will always be against Modi as many of them are controlled by communists and evangelists.However the central government can't keep quiet with aggression against minorities by fringe groups and electronic media is definitely going to gloat over every setback to Modi. It is very likely that Muslims, Christians and people from North East (and most of them are Christians) voted enmasse against BJP because of perceived injustice which is accentuated by hostile media. In all probability with this kind of Majority you will be seeing 'AAP goondaism' in the form of Mohalla Sabhas in full-force. AAP vigilantes who almost ran a parallel government trying to 'check' and 'judge' the functioning of various departments / schools / hospitals will do it with even more force this time. This will be one of the reasons, 5 years hence, when AAP & AK's reversal of fortunes is analysed. For the sake of Delhi, I hope I am not prescient. About Media, I wont even write about them. Let them say / write what they want to. I want to bring up one important point using the same stupid Media logic after Lok Sabha polls. Only 55% people voted for AAP not WHOLE of Delhi. So 45% (that is almost half of them) REJECTED it. Media Crooks any one listening ? Only 55% voted for AAP. In-fighting is one of the main reasons for this result of Delhi assembly elections. Also, when someone who has joined the party very recently (just a few weeks before the elections) is given preference over the rest for the position of CM, it would definitely have major impact on those who might be aspiring to be the CM of the state. So, they might have done their best to ensure that the new candidate is not won. Also, depending heavily on one person elections after elections, is not a good thing for the party. Apart from all these things, one more thing might need to be checked once. It's not that AAP has done something wonderful (except for campaigning for the elections and accusing BJP for each and everything that goes wrong, irrespective of whether it's relevant or not) to get such majority during the elections in recent times. Also, it's not that that BJP has done worse to end up just with 3 out of 70. 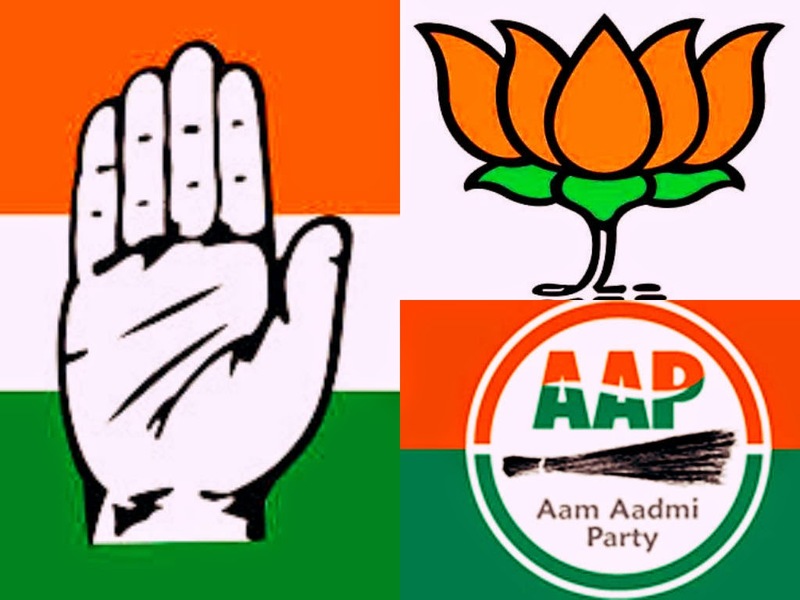 If the vote share is looked it, it might be like all the 'sick'ular parties have worked together in the background to ensure that all the non-BJP votes are casted in favour of one party and that one party happened to be AAP in this case. For the past one year or so, all these 'sick'ular parties have openly expressed their intentions to defeat only one party, that's BJP. But they could not succeed much. So, this time, they seem to have worked together quietly and achieved what they have been dreaming of, for the past one year or so. With this result, they would have definitely gained enough confidence and will come up with similar strategies going forward, wherever there would be elections. So, ultimately, they are going to make it BJP Vs the rest. in one way, it might be good, as there won't be any possibility of hung assembly or hung parliament, going forward. On the other hand, it should prompt the current central government to perform as per the expectations of the people. Otherwise, it won't take long before they are rejected by the people. Dear Mohammed, thanks for sharing your views regarding beef. Regarding imams, they do not preach violence so could you explain the reason for home-grown terror and the tacit support that is shown to pakistani terrorists. I'm sure without local support it isn't possible for terrorists to carry out massacres on a large scale. Even if we assume that the imams are completely innocent in these matters, I'm sure they do not preach universal love and brotherhood like majority of the Hindu saints do. Most of the time they are very sectarian and I feel it is because of the underlying intolerant philosophy of islam. And btw, could you please enlighten me how are the muslims oppressed? It was a revelation to me to know that Muslims are still surviving in India because they do not bow down. they are surviving because Hindus are the most secular and tolerant and respectful of other faiths. Kindly clear your misconceptions. And what about the oppression, the destruction of temples that your ancestors have done over the centuries???? Of course Islam would justify that saying thats would the kafirs deserve. What else can you expect from a religion born out of tribal mentality? Grow up dude. Be a civilized human being first and then study your religion. But unfortunately you won't. Btw, forgot to add regarding beef. So you think only as a matter of status muslims should refrain from beef else it is alright to mercilessly butcher an animal who provides the human society with the most nourishing food. And now thats called civilized, wow !!! I was awaiting this post. You rightly mentioned that PM should only concentrate on the issues of our country. Many of us agree on this that there is no doubt on the pious intentions of Mr. Modi to work towards betterment of India. I think it is Amit Shah's strategy to pull Modi for state election campaigning post Loksabha win. And that worked to some extent also. Media is going gaga over AK's win. Many journos from print media and electronic media was amazingly happy. You must have seen it in Ornob's show. I don't know why do they hate Modi so much? Most of them discussed Ghar Vapsi,Sakshi Maharaj, Bhagvat's statements and the silence of Modi on these issues. I want to know when ghar wapsi was happening in the congresss rule then why at that time these same media people was sleeping? Muslim preacher Zakir Naik very frequently arranges programs for conversions then why the same media don't utter a single word on religious conversions based upon his lies? Missionaries based upon temporary allurements are doing conversions but the great tolerant media people think that uttering a single word on this will harm their secular credentials. You were referring to what happens in the Thappad party, but gave the name of BJP, just because you hate it for reasons known only to you. All these 'reasons' touted by various commentators are nothing but guesswork. Fine BJP made mistakes, these reasons may explain defeat. But what is so horrible that the BJP has done, and what is so great this party has done, in the last 1-2 months, that the score is 67-3? Everyday the fraud party had one key member leaving them. No respect for women, despotic, fraud donors, dharna culture, no internal democracy. What did the fraud party do so right that BJP has to introspect? What I am surprised is how it is an exact repeat of 2013. Same technique of comparing airy-fairy promises to actual work of others and shining in comparison, same unexpected success and same shock in the BJP camp. What has changed? The only thing that has changed is they proved how utterly incompetent they were. Kejriwal ran away after 49 days. Why did he run away? Because he could not manage. National ambition was a smokescreen. He ran away because he is incompetent. Maybe he did not want to rule. But even that is not surprising in incompetent people. There have been hundreds of CMs. All have tried. It is a humongous task to govern well. And this theater artist will govern like no one before? He has failed and he will fail again. Instead of this useless self-flagellation, we should look ahead, The focus should be on proving what a bunch of frauds they are. Denuding them of their aura is of utmost importance so people know there is no alternative to BJP. And this nincompoop will give plenty of opportunities, Personally I tremendously dislike parties built around one person and one family. They are nothing but vehicles of that one person;s ambition. The negative strategy which only worked towards putting allegations on daily basis on Crazy Wall was not right. It would have been better if they banked upon citing their achievements in 8 months time. The make in India and the successful tours could be highlighted. The 10 Lakh suit and its propaganda by Pappu also back fired. There are some other positive things which could have been put forth by BJP but alas it didn't happen. Time will tell how AK deals with the huge promises. AK is scared with this kind of mandate. Good observations as usual from Being Cynical. Forthright and to the point. Modi should do what he is elected for and not be in the campaigning mode always. After some time the law of diminishing marginal utility sets in. Also Delhi is a little peculiar. The "side lining" of LK Advani and other senior leaders who have made Delhi their home has not gone down well with the loyal BJP electorate of Delhi. All said and done, LK Advani may be old but we do not cast away our parents once they have become old. LK Advani was/is the foundation (invisible unlike Vajpayee but more stronger and on the ground) on which the BJP pedestal has been built and he should be respected. Public perception that he is side lined and not heard - the Marg Darshak Mandal - has not met - it is a good time for it to meet in the aftermath of Delhi results - does not augur well for BJP. Allies however small and outnumbered they may be are also turning uncomfortable. Somehow it has turned out to be Modi-Shah orchestra only. Do Shivraj Chauhan, Vasundhara Raje and Dr. Raman Singh do not belong to BJP anymore? BJP loss in delhi this is results of BJP goes same root of congress. According to ur 5 th comment now AAP play secularism politics to create more worsen condition in India.